TIl superbo complesso delle Ville Orfos ha ricevuto il riconoscimento della Regione delle isole ioniche e dell’Ente ellenico per la standardizzazione ELOT e ha ricevuto la targa per la Migliore qualità e innovazione nelle isole ioniche. Questo premio privilegiato ha riconosciuto i raffinati standard raggiunti dalle Ville Orfos nell’offrire ai propri ospiti il soggiorno più confortevole e gradevole possibile. Queste bellissime ville ricevono regolarmente lodi e riconoscimenti di eccellenza e qualità per le strutture ricettive. 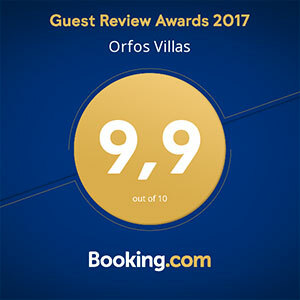 Le Ville Orfos sono presenti anche su tripadvisor.com come una delle migliori Altre sistemazioni di Agios Nikolaos grazie agli eccellenti commenti ricevuti dai suoi ospiti. Why go... To escape the miserable British summer and enjoy some of that Mamma Mia-style feelgood factor: blue skies, beach tavernas, turquoise sea, the buzz of cicadas and the scent of pine and herbs. The most southerly of the Ionian islands, Zakynthos (also known as Zante) has temperatures in the mid-70s in September – and it’s much greener than its parched, end-of-summer Aegean neighbours. Unless you want English pubs and all-night partying, avoid the pockets of booze-and-brawl tourism along the south coast that have tarnished the island’s reputation (Laganas is particularly grim) and stick to the beautiful, unspoilt north and mountainous west of the island. Or base yourself on the pine-forested Vasilikos peninsula in the south-east, most of which has been protected from large-scale development because of the loggerhead turtles that breed on Gerakas beach. Travel by... Plane Monarch (0871 423 8564, www.monarchflights.co.uk) flies direct from Gatwick and Birmingham from £169 return until the end of October. Thomas Cook (www.flythomascook.com) and First Choice (www.firstchoice.co.uk) also operate direct charter flights: most are once a week at this stage in the season, but you can arrange a short break by returning on a scheduled flight via Athens (connections are good). Olympic Holidays (0844 499 2211) can organise this for a combined fare of £287.23. 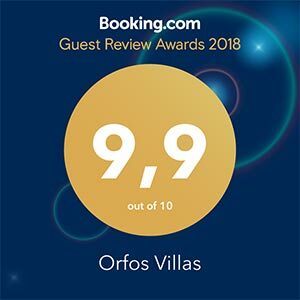 Stay at... Orfos Villas (www.orfos-villas.gr) in Agios Nikolaos on the north-east coast, a group of four comfortably furnished and well-equipped houses in a peaceful hillside location. Each has a small pool and shaded balcony with stupendous views. Book through the British tour operator Peligoni (01243 511499, www.peligoni.com), from £165 a night for a villa sleeping up to six. Panorama Studios in Agios Nikolaos (0030 269 503 1013, www.zanteweb.gr/zakynthos.zante/en/panorama-studios) has 11 clean, freshly decorated, good-value rooms, each with a bathroom, cooking area and terrace or balcony from €30 (£24) a night for a double including breakfast; no pool. The new boutique hotel Belvedere (www.belvederezante.com) sits on a hill overlooking Gerakas and Porto Roma bays. Attractively decorated in blues and whites, it has a nautical feel and lovely views from the pool. From £60 per person per night with breakfast, or £612 for a week’s flight-inclusive package through Simpson Travel (020 8392 5852, www.simpsontravel.com). Spend the morning... On a boat trip from the little port at Agios Nikolaos (for about €20). This is the best way to explore the island’s craggy northern coast and one of Zakynthos’s prize sights, the dramatic Blue Caves. Swim and snorkle among the limestone caves and arches, which reflect the improbably turquoise sea. Most trips continue for more swimming at Shipwreck Cove – a picture-postcard arc of white sand and pebbles accessible only from the water, where you’ll see the hulk of a cigarette smugglers’ ship that beached there 30 years ago. Lunch at... The little hamlet of Micro Nisi on the north-east coast, with a choice of two restaurants. Vardiola, known locally as Nicos (0030 694 767 0624), is on the right of the main road as you head north, with a balcony looking out to sea; excellent pork steaks for €7. The eponymous Micro Nisi restaurant (0030 697 305 0680) serves simple taverna dishes on a terrace overlooking the ocean; main courses from €10. Down on the south coast, the simple little beach bar Notos, at Kaminia, is tricky to find but worth the effort for a glimpse of the Greece of 40 years ago. Take the road from Lithakia to Keri and turn left after 700m on winding tracks through ancient olive groves to the thatched bar overlooking a pebble beach and peaceful bay. Stroll around... The narrow lanes of Volimes and other traditional hill villages such as Exo Chora – and Kampi, with its fabulous sunset views. There are some spectacular walks in the north and west of the island – consult the reliable Zakynthos Sunflower Complete Guide by Gail Schofield (Sunflower Books, £12.99) for directions and helpful maps. Walking to Heal (www.walkingtoheal.com) organises guided walking holidays all over the north of the island. Or, for a more urban experience, wander along the waterfront and around the squares and passages of the capital, Zakynthos Town. Once known as the Venice of the south, it was flattened in the 1953 earthquake, but the area around Solomos and St Mark’s squares has been sensitively rebuilt and has a cheerful, buzzy atmosphere. There is a model of the original Venetian town, and artefacts from the pre-earthquake era, in the Museum of Post-Byzantine Art in Solomos Square. Don’t miss Agios Dionysios church, which was rebuilt in the mid-20th century but is impressive none the less. Buy... Honey and olive oil (but remember you can’t carry them in your hand luggage) from roadside stalls around the island. Volimes is the centre for carpets, lace and other traditional handicrafts. Have dinner at... One of the island’s simple tavernas serving local dishes. Zakynthos is not a foodie destination, but La Storia in the little port of Agios Nikolaos (0030 269 503 1635) has a superb setting with tables right on the beach and lights twinkling across the harbour. The sea bream is a good choice if they have it; about €25 a head with wine. Kaminaki in Anno Volimes (0030 269 503 1304) is run by the exuberant Dennis and has excellent spit-roast suckling pig; dinner about €20 a head. Also in Anno Volimes, Sophia’s Restaurant (0030 269 503 1534) has recently opened in a beautifully restored traditional building. It serves local dishes using island-reared meat and organic vegetables; dinner €25-30 a head. Stay up late at… Mahogani Art Cafe (0030 269 503 1534) in Agios Nikolaos (on the left as you approach the port from the south). White walls and sofas, modern paintings, eyebrow-raising sculptures, great cocktails and music. Recover at... Gerakas beach, a perfect curve of golden sand, set right at the tip of the Vassilikos peninsula; those loggerhead turtles know how to pick a good spot. At all costs avoid... Laganas, with its shades of Magaluf.